Another giant (and weighty) leap for comics history as Taschen delivers the goods on Marvel. The huge books follows the same format as the story of DC Comics Taschen published in 2010 though with a couple of differences: the five fold-out Timelines in the DC book are now presented as a loose insert printed both sides and folding out to fifty-five inches wide; there is no index, which I find sort of amazing in a title like this. The editorial covers eight decades of Marvel and author Roy Thomas would seem the obvious choice to write about the company, he was an editor there from 1965 to 1980. The four chapters, each opening like the DC book with a spread wide bit of art printed on thick paper with reflective metallic ink, look at the origins of Martin Goodman and his Timely Comics of which Marvel was a subsidiary group of titles. Timely morphed into Atlas comics in 1951 which eventually, in the early sixties, became the Marvel line that carries on today and the book is right up to date, too, with the cover of Black Widow issue six from July this year. A nice feature of the editorial are references to comic and media items through the decades and how they related to Marvel and their comic characters. I think the real strength of the book is the art, pages and pages of covers, spreads, individual frames and several examples of cover art (blown up big) as inked but before the color was added. A two-page foldout of Steranko's spread from Strange tales 167 is also included. The book's production is, as the DC title, first-class. 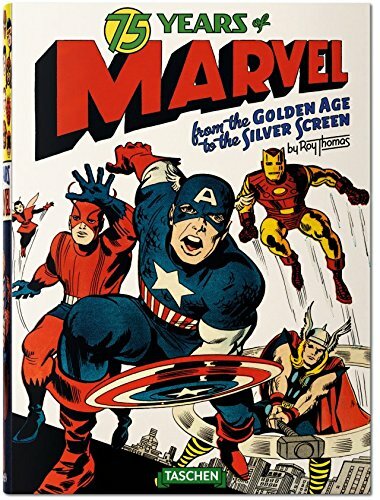 Beautifully printed and bound with all the images getting deep comprehensive captions, eight pages at the back have biogs of several dozen writers and artists who were the real masters of Marvel. Taschen have thoughtfully provided a blue silk bookmark. Overall a feast for the eyes but what will the next book be about? I'm putting my money on EC comics getting the Taschen treatment, in three or four years time. The huge book comes with a handy cardboard carry case. Right: there are several pages that show inked cover art.